Today most people are familiar with paper shredding. It is commonplace to find a shredder in most homes. But like so many things that are mundane today they are actually a relatively new invention. They have become popular to battle modern problems of the information age. The first US patent for a paper shredder was issued in 1909 to Abbot Augustus Low of New York . The invention never went very far and was never marketed. The first marketing of an electric paper shredding machine started in Germany in the 1950s. Adolf Ehinger sold the devices to governments during the cold war. The company still sells shredders to this day. The use of shredders for destroying documents was largely the realm of governments until recently. Over the years companies have become more interested in protecting their internal information also. Industrial spies were able to exploit dumpsters for sensitive data. In 1984 the Supreme Court ruled that anything left out in a trash can was not protected. This only served to increase the use of dumpster diving for stealing company information. To protect themselves, business now hire shredding services to prevent the disclosure of private information through their trash. The ease of getting credit since the 1970s has made the practice of identity theft more common. The irony is that while much of the fraud is committed online, the source of the data is usually offline. 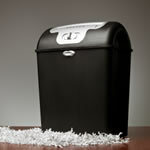 To protect their information many people have a shredder to destroy financial information before it is thrown out. The evolution was final from large governments to large businesses and finally homes. The scourge of identity theft has also resulted in state and federal legislation to prevent information from leaking out of businesses. This takes the form of laws requiring shredding. The two biggest federal laws are FACTA and HIPAA that regulate the credit industry and the health care industry respectively. This has led most business to need a paper shredding service to economically deal with the destruction of customer information. There are several types of paper shredders. The smallest shredders use blades to cut the paper. This can be in the form of strips or squares. There are several trade names including micro-cut and confetti-cut but this is just a synonym for a shredder that cuts in two directions. These work well for small jobs of a few pages but the technology does not scale well. Industrial shredders use several different technologies. Grinders use multiple rotating blades to grind the paper down. When it is small enough it falls through a screen to guarantee particle size. Hammermills use a mechanical hammer to pound the paper through a screen. There are also shredders that use rotating blades to rip the paper apart. Grinders have the advantage of being able to shred materials beyond paper. All have the advantage of eliminating blades that will dull too quickly for high volume shredding. The German Institute for Standardization sets the standard for shredding particle size. There are 6 levels of security they recognize. The largest, level one is 12mm strips. Level 5 is considered top secret by the department of defense. The specification calls for particles no more than 0.8mm by 12mm. The generally accepted standard for commercial document shredding are particles of less than 9.5mm in diameter. This should be the baseline for any shredder purchase.